Dickie Gibbs delivers a pitch. 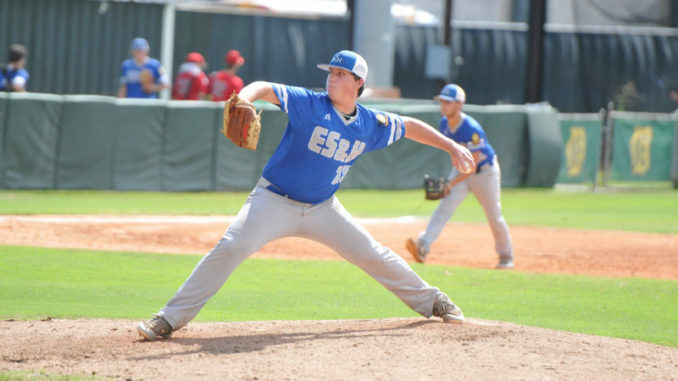 Even after losing its first game in the double-elimination American Legion state championship tournament, Destrehan-based ES&H Wildcats weren’t willing to settle, rallying back to win two straight games to keep their championship hopes alive. But the team came up short of living out its championship hopes, its season officially coming to an end Monday at the hands of Jesuit-based Retif Oil, 11-0. 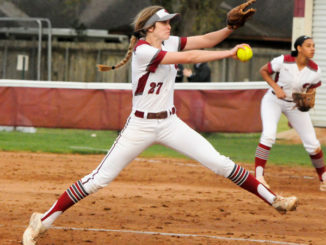 Destrehan absorbed a 7-4 loss to Rummel-based Deanie’s Seafood to kick off its tourney fare on Friday. The team rallied to upend the Crowley Millers on Saturday, 3-2, before earning a 7-6 victory Sunday in a rematch with Rummel to keep itself in the mix. But Jesuit proved too powerful for a Wildcats’ team full of fresh faces that outperformed expectations this summer and showed strong potential for next prep season. Jesuit scored its 11 runs over the second to fifth innings to put the game away in five innings by the 10-run rule. Will Moran went 3.1 innings of scoreless ball to earn the win, while Destrehan’s Joshua MacCord took the loss. Nathan Rhodes led Destrehan (13-10) offensively by going 2-for-2 at the plate. Winning the tournament would have been a difficult trek after DHS lost its first game last Friday, which meant to earn the state title, it would have needed six straight victories. 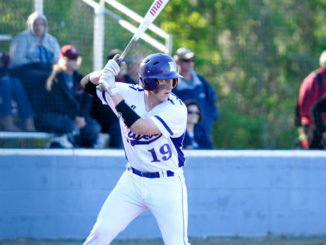 Sunday’s game against Rummel saw the Wildcats stay alive on some seventh inning heroics by Josh Vicknair, whose RBI double to right field drove in Nathan Rhodes, who scored the decisive run in the top of the seventh inning. Max Jacob pitched a scoreless inning and earn the save, striking out two Rummel batters along the way. He went three innings on the day and allowed two hits while striking out three. 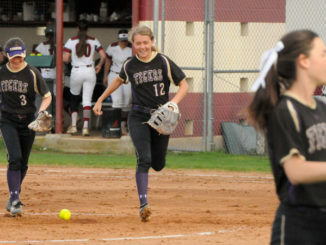 The Wildcats jumped out to a 3-0 lead in the second inning before Rummel fired back with six runs in the bottom of the fourth, putting Destrehan’s back against the wall. Destrehan clawed back in the top of the sixth where it plated three runs, the last on a game-tying double by T.J. Thomas that scored Dylan Weber. Vicknair swung a hot bat on the day, going 3-for-4 with two runs scored and an RBI. Dustin Weber went 2-for-2 with three RBIs and a run scored. Thomas drove in two runs as well for Destrehan. Ahman Morris, Weber and Vicknair each doubled in the game. Brock Mire earned the win in a game the Wildcats called upon five different pitchers, also including Nathan Rhodes, Michael Mollere and Nathan Schexnaydre. In the win over Crowley, T.J. Thomas started and went 6.1 innings while allowing two runs (one earned) on two hits and two walks. He struck out four. Joshua MacCord earned the save, striking out two and allowing a hit over 0.2 innings of work. Thomas, Jacob, Schexnaydre, Rhodes, Vicknair and Dustin Weber combined to each collect one of the team’s six hits on the day. DustinWeber finished the summer perhaps swinging his team’s hottest bat. The tournament opener saw Rummel rally from a 2-1 deficit to score six runs over the sixth and seventh innings in a 7-4 win. Dickie Gibbs went five innings for DHS, allowing two runs (one earned) on two hits and seven walks. He struck out four. Ty Boyne took the loss in relief. Offensively, Rhodes led the Wildcats going 2-for-3 with two RBIs. Dustin Weber went 2-for-3, Jacob went 1-for-4 with a run scored and Dylan Weber went 2-for-4 with a run scored and RBI. Nicholas Schulin went 1-for-1 off the bench with a run scored. The state tourney wins came in close games, similar to how many of the Wildcats’ victories this summer had come. Particularly for a team lacking experience, late game execution has been on point. 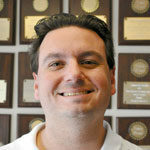 “We’ve figured out that our guys like to compete,” Mire said. “We still have some questions to answer, but we feel like we’ve got some pieces and now we just have to figure out how to best utilize them together. But they get after it, and that’s a really great mindset to take into next year.